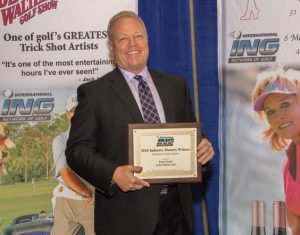 ORLANDO, FL – Wilson Golf GM Tim Clarke, Tour Edge’s Exotics EXS Driver and Knuth Golf’s High Heat 257+ metalwoods were among the winners in the 25th Annual ING Industry Honors awards program. Results in 12 categories were announced Thursday at the PGA Merchandise Show. 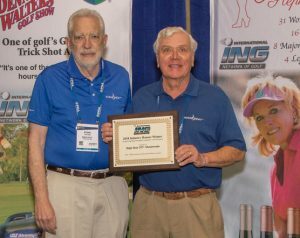 The ING Industry Honors program recognizes outstanding achievement in the golf business. The non-profit, media-based networking organization International Network of Golf conducts the awards program. Nominees in 12 categories are submitted throughout the year from anyone in the golf industry. Sub-committees that include experts in each category then trim the entries to the top three in each category. ING members then vote electronically to determine the winners, who are announced and recognized at the Industry Honors Presentation Press Conference. Holly Geoghegan of Golf Marketing Services is the committee chair. 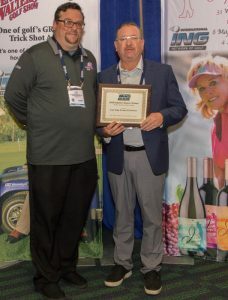 Clarke is widely credited for bringing Wilson Golf back into relevancy in recent years and was honored by ING in the Business Achievement Category for those efforts. Tour Edge and Knuth each won their respective Product Ingenuity categories for their cutting edge products. Other winners included Youth On Course in the Player Development Category, CopperTech Glove in the Product Ingenuity-Soft Goods/Accessories Category and Voice Caddie in the Product Ingenuity-Technology Category. LPGA took home the TV Commercial Award and Callaway the Print Advertising top honor. For more information, visit www.inggolf.com.